Last week, we did a successful video conference call at the BGC office of our client with their US-based (California) counterparts. It was the culmination of two (2) weeks of stressful preparation since we were beset with logistical and technical problems. 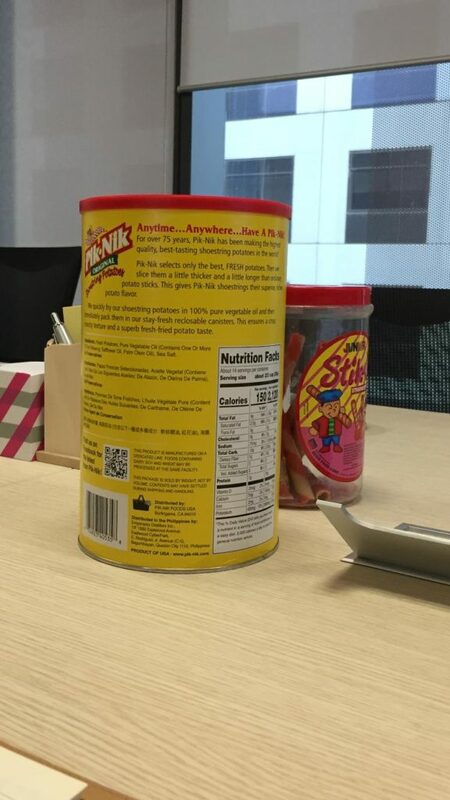 During the videocon, a huge can of Piknik which I have always loved since childhood and a plastic container of Sticko stared me in the face. The sight made me crave and my hunger pangs were awakened. After the videocon, my Cash management colleagues, Larns and Franz, and I crossed to Shangri-La The Fort where our branch was located. 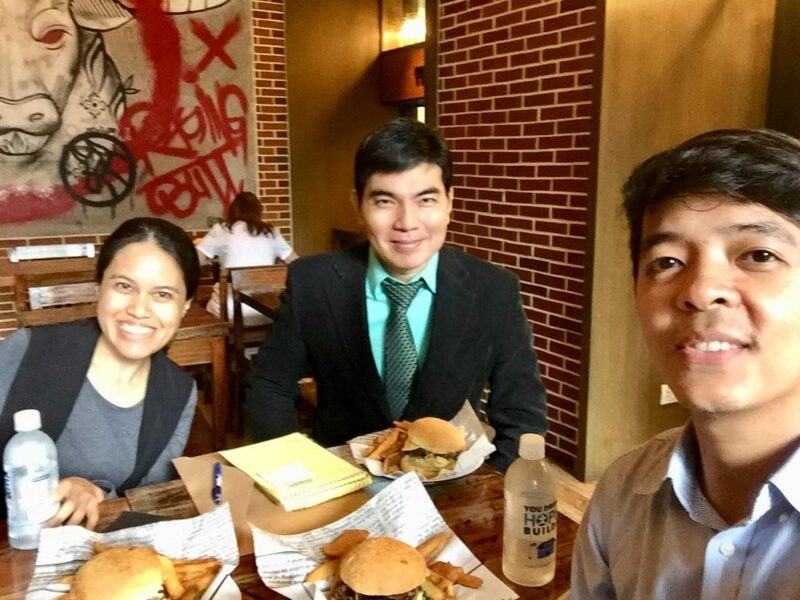 After meeting the branch manager and requesting for some corporate papers, we were consumed with hunger so we decided to try the first restaurant we saw – Raging Bull Burgers, owned by the hotel. We entered the restaurant and were told that they open at 11:00 AM so we decided to just wait inside and go through the menu. 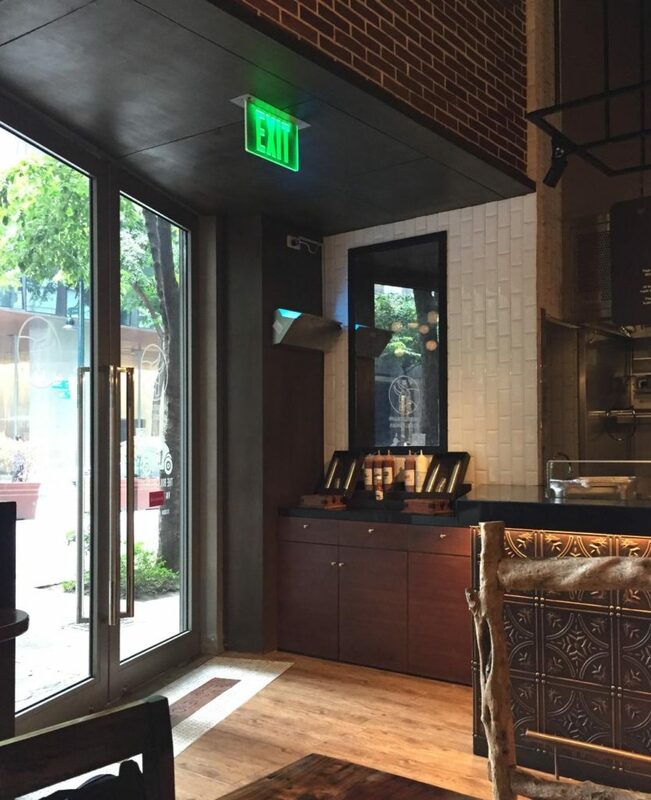 The restaurant has this cozy atmosphere and it caters to hotel guests and outsiders since it is along 30th Street corner 5th Avenue. It is part of the hotel but is accessible from outside. 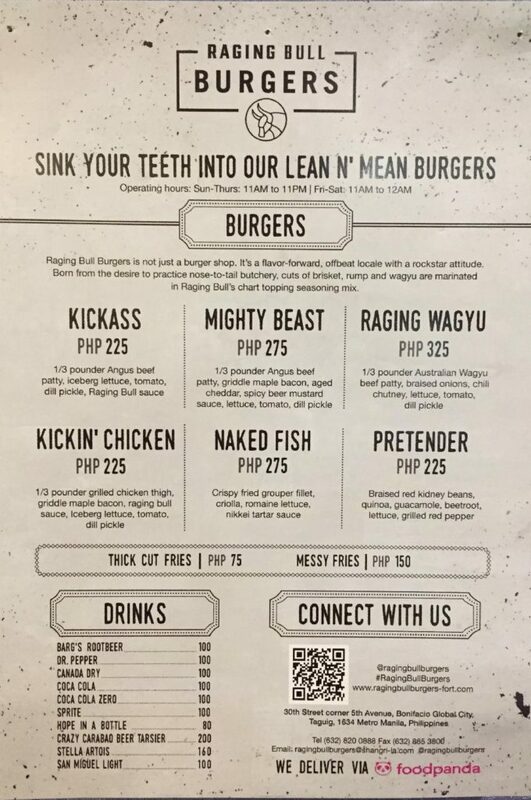 Aside from offering 3 types of “lean n’ mean” burgers plus their burger of the month, they also serve “Kickin’ Chicken” which is 1/3 pound grilled chicken thigh, “Naked Fish” which is crispy fried grouper fillet, and “Pretender” which is braised red kidney beans, quinoa, guacamole, beetroot, lettuce and grilled red pepper. 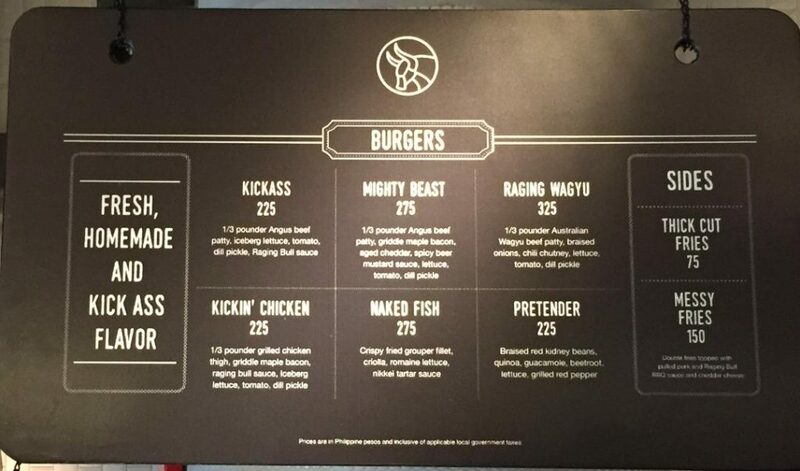 Kickass (P225) – 1/3 pounder Angus beef patty, iceberg lettuce, tomato, dill pickle and Raging Bull sauce. Raging Wagyu (P325) – 1/3 pounder Australian wagyu beef patty, braised onions, chill chutney, lettuce, tomato, dill pickle. 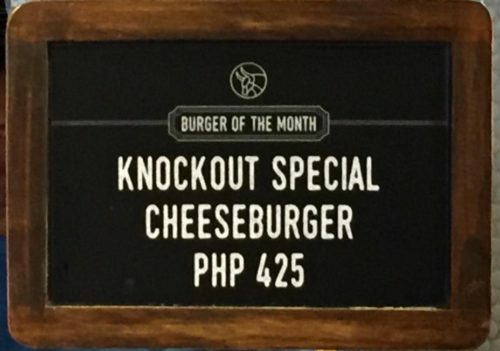 Knockout Special Cheeseburger (P425) – this is their burger of the month. Mighty Beast (P275) – 1/3 pounder Angus beef patty, griddle maple bacon, aged cheddar, spicy beer mustard sauce, lettuce, tomato, dill pickle. My Knockout Special Cheeseburger was a winner. 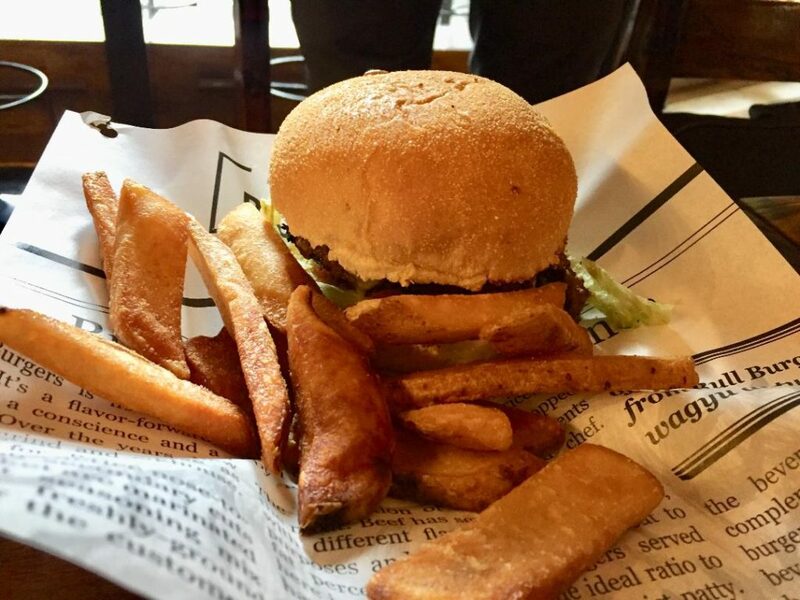 The burger sandwich was served hot together with thick cut fries (P75). The beef patty was moist, tasty and tender and the sauce did not overpower the taste of the meat. 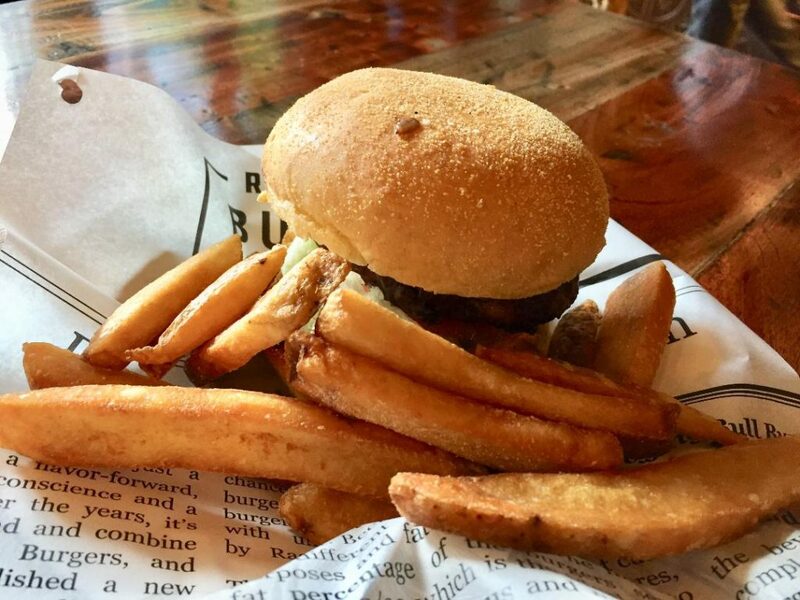 Other burgers crowded with sauce lose its identity and distinct beefy taste. For me, just cheese, some kechup, mayonnaise and mustard and you’re on your way to a pleasurable burger experience! Loved my burger! After our successful videocon, we deserved a great meal indeed. Delicioso! Some quibbles: I was “bitin” after eating my burger so maybe they should offer a ½ pound burger; their thick cut fries was also “bitin” and I wanted more; they had soft drinks in can in their menu but they only had beer in their refrigerator that morning (I saw bottles of Stella Artois) so we had to settle for bottled water; they also had milkshake in their menu (chocolate, vanilla and strawberry) which was, unfortunately, not available. Thought I could end my delicious burger meal with a glass of cold strawberry milkshake! 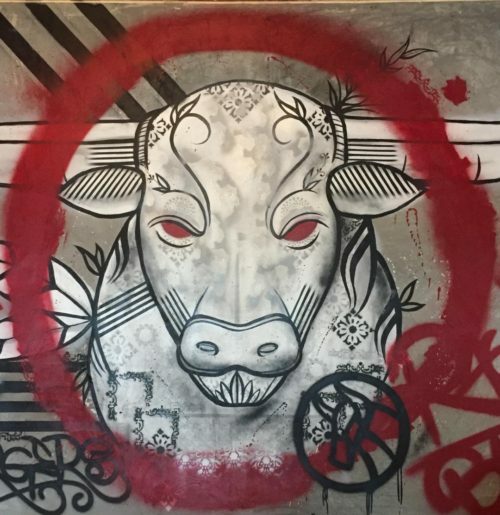 Raging Bull Burgers is located along 30th Street corner 5th Avenue , Bonifacio Global City, Taguig 1634 Metro Manila, Philippines. Operating hours: Sunday – Thursday 11:00 AM to 11:00 PM. Friday – Sunday 11:00 AM to 12:00 AM. 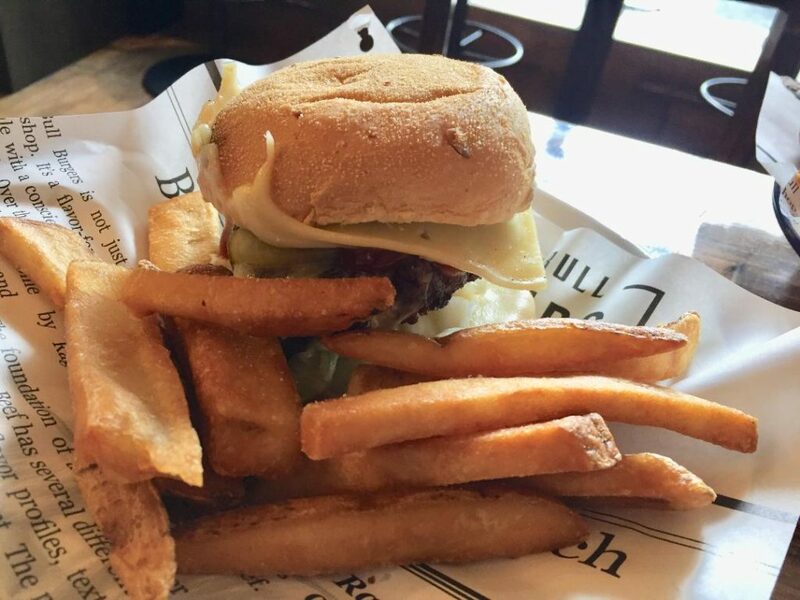 You really can’t go wrong with burger! 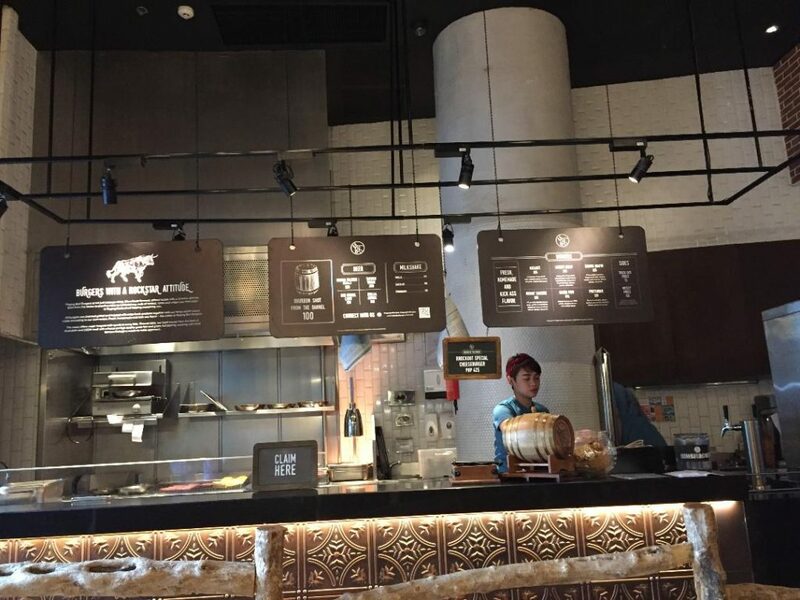 Your selections look tasty and flavorful. Yum! cooked with love and care. Let’s eat !!! Merely wanna remark on few general things, The website pattern is perfect, the content is rattling fantastic : D.
Sir Elton John is my favourite singer of the world. IвЂ™m very happy to present for you this setlist. Check Elton John final Farewell Yellow brick Road tour tickets link to get your best ticket for the retirement Elton John tour in 2019.